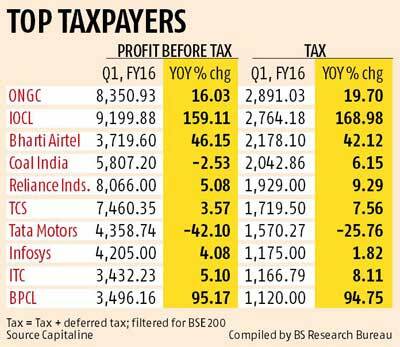 The tax outgo of Indian companies rose faster than their profit before tax in the quarter ended June this year. This was because new accounting norms disallowed tax deferrals, while revenue recognition of projects before completion became more stringent, experts said. Data on BSE 200 companies show the total tax outgo of these firms rose 12.7 per cent during the June quarter, compared to the year-ago period, even as their profit before tax rose 5.6 per cent (excluding banks and finance companies). Of the top 10 tax-paying firms, the tax outgo of many was up substantially; in a few cases, it grew faster than profit. Experts say as the new accounting standards provide clearer guidelines for revenue recognition, the subjective interpretation for deferring income is curtailed. “This could result in earlier cash outflows in the hands of a few assesses by way of tax. The real difficulty, however, is some entities might need to recognise income before the actual receipt, reducing liquidity in the business,” said Riaz Thingna, partner, Walker Chandiok & Co LLP. This is likely in case companies have to recognise income on a percentage basis, based on the project work already completed. Suresh Surana of RSM Astute Consulting said another reason why the tax outgo of Indian companies rose was effective tax rates had increased marginally this financial year. “Due to tax rates going up to 34.6 per cent this financial year, companies will end up paying more tax than last year,” he said. For 2014-15, the corporation tax rate after surcharge for firms with income of more than Rs 10 crore was 33.99 per cent. Corporate leaders say the higher tax outgo due to the new Income Computation and Disclosure Standards comes at a time when private investment is drying up. It is expected the tax outgo of companies will rise further. “Corporates will be impacted because their tax outgo will go up due to removal of exemptions from the next financial year. This isn’t good news for companies facing lower sales and profits due to the slowdown,” said the chief financial officer of a large company. In Budget 2015-16, Finance Minister Arun Jaitley had announced the corporation tax rate would be reduced from 30 per cent to 25 per cent, through four years beginning the next financial year. By and large, India Inc’s performance in the June quarter was tepid due to a weaker-than-expected recover in demand, high real interest rates and negative Wholesale Price Index-based inflation, which led to lacklustre industrial growth. Growth in corporate earnings has been stuck in single digits through the past three years.